TELL ME HOW!! TELL ME WHY!! In our everyday myriad insignificant living day in and day out, maybe we have stopped asking some basic questions we use to intrigue ourselves regularly “when we were young”. It is often reflected when I go for my fortnightly visit to my barber – I ask him incessantly “am I going bald” – he normally reverts back asking “is your father bald” – my answer is a blank stare and rhetoric pause and the emphatic NO soon follows suit. If I am so obsessed with asking if I were going bald, why not excite myself with the most common desert view I see regularly and try to pique myself to find out why it happens. My uncle use to give me money for buying books – the first instalment of money put together and I bought a series called “TELL ME WHY” – and later argue endlessly with my childhood and still friends Bedanta lovingly called “bedu” on various unnatural phenomenon and common unscientific Harry Houdini stuff. I simply couldn’t reach out to my “TELL ME WHY” collection in the old dusted library lying near my low lying bed in my bedroom few oceans and mighty rivers away in India (Assam – Duliajan). They have been long forgotten and married to fine dust. Shubha and her father too tried with similar results. So, here I am going back to finding out WHAT IS AN MIRAGE? And here’s what I found out – this time googling away to glory. You see it not only in desert but also hot summer days in your lane as well, false impression of water reflecting from the surface – as scientist and ignorant observers say, it is also seen in Polar Regions albeit with different effect. We will come into that later, but first a little primer in physics you ignorant adult communion!! 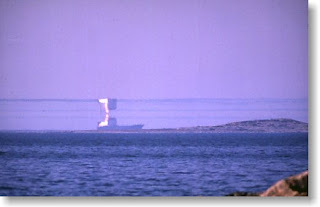 Wiki adds: “The model given above explains the cause of the inferior mirage, called "inferior" because the image seen is under the real object. The real object is the (blue) sky or any distant object in that direction, meaning we see a bright bluish patch on the ground in the distance. 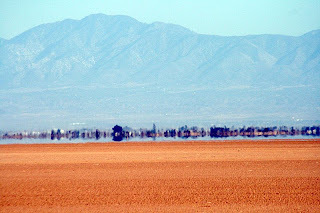 For exhausted travelers in the desert it appears as a lake of water. On tarmac roads it may seem that water or even oil has been spilled. This is called a "desert mirage" or "highway mirage". Now since you know why it happens in desert and the whole funda about warm air and cold air – what really happens in roads while we drive something which Ani noticed!! How come water appears in the distant highway? A highway mirage is an inferior mirage which can be seen very commonly on roadways by day or by night. The hot-road mirage is usually most noticeable on hot sunny days. Now let’s talk about the other phenomenon – also called superior mirage often seen in polar “chill” regions. Now you know why MIRAGE happens – Ani this goes for you for bringing back the TELL ME WHY avatar in me long known to be dead!! great! thanks for explaining it so well in simple terminology. i used to be a tell me why freak too reading stuff like "why does the moon follow you when you are in a moving car?" things we just notice and then let go.